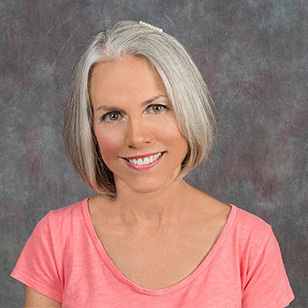 "As a sales/designer at Closet Works, I am able to blend my passion for design, love of working with people, and penchant for organization into a profession in which I excel. 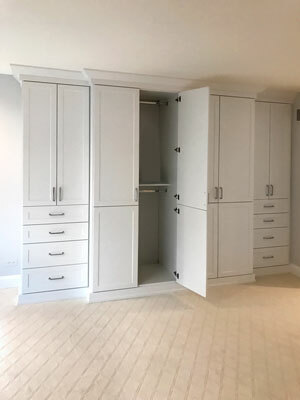 My background includes an Interior Design degree and many years of experience in space planning and design consulting, in the custom closet and kitchen remodeling industries. I enjoy listening to and consulting with my clients to help them realize their dreams of organized and beautiful spaces. Attention to detail, during the initial consultation and throughout the design and installation process, results in customized personal spaces that are both functional and aesthetically pleasing. Closet Works has a 30+ year history built on a reputation of innovative design and stellar customer service. I am proud to be part of a professional team that strives to deliver outstanding client satisfaction!" 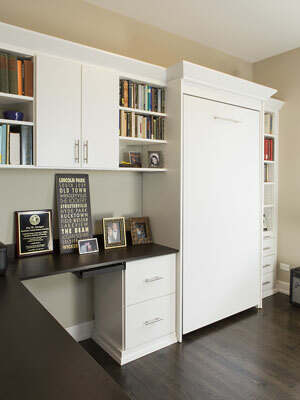 Lisa is veteran closet design professional, having worked throughout the industry for many years. 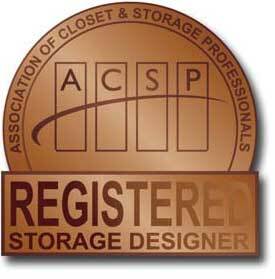 Her talent and achievements are recognized by the ACSP, having been awarded certification from the national Association of Closet & Storage Professionals, the industry's top professional organization. 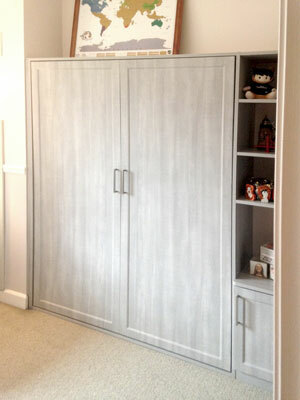 Lisa designed this beautiful built-in bedroom wardrobe as a storage solution for a very busy client in need of somewhere to put her diverse wardrobe. 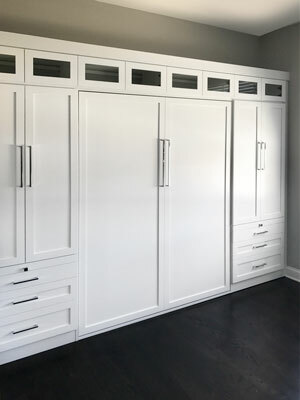 With shelving behind doweled doors for multiple pairs of shoes on one side, and shelving for her workout wardrobe and gear on the other side, this wardrobe accommodates her active lifestyle while looking absolutely stunning in the bedroom. A design like this keeps everything perfectly organized for you to always be able to tend to your baby. The design simplifies baby-duty in plenty of ways to keep both you and your little one happy. 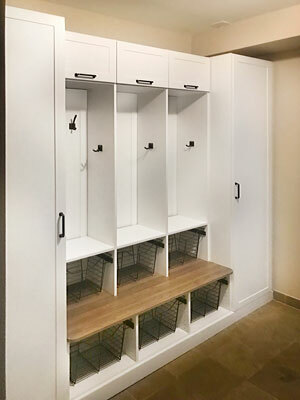 This reach-in closet focuses on adaptability, convenience, and maximizing space with its adjustable hanging sections, pull-out wire baskets, hooks, shelves, and the alcove for additional storage accommodating more than one child. This sleek and functional design is versatile for a potpourri of things. The design offers hanging and storing folded clothing, but and includes shelving for folded items and keepsakes. The design leaves room at the top for additional storage beneath the sloped ceiling. 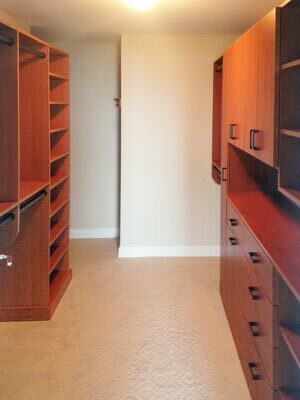 This walk-in closet was designed for a client's son and resulting design is full of function and style he is sure to be happy with. 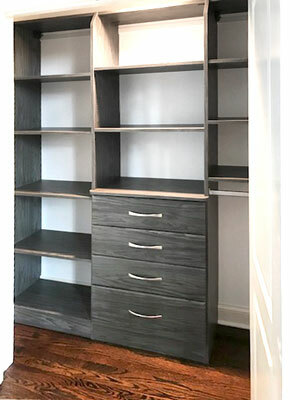 The design is in a Sunset Cruise laminate with brushed chrome Curved handles, giving the closet a very transitional look that is cutting-edge with a soft balance. The drawer faces are in a beveled Elegante style for subtle, elegant detailing. This arrangement of shelves and oil rubbed bronze baskets allows plenty of storage space and offers convenience with the pull-out features. The oil rubbed bronze used with the white laminate creates a nice contrast and modern look. 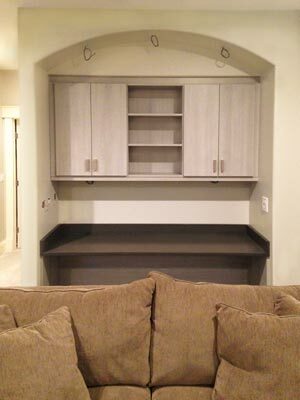 This unit was designed with a number of intersecting wide shelves for an excellent way to save room by maximizing corner storage. 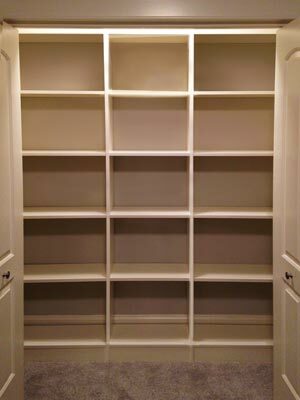 You can easily store a seemingly endless amount of shoes and folded items on these generous shelves. This distinguished esign is striking and spacious. 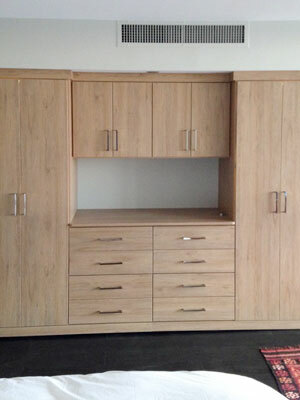 The design includes hanging, shelving, cabinets, and even dresser drawers. The rich maple finish evokes a warm and inviting tone. 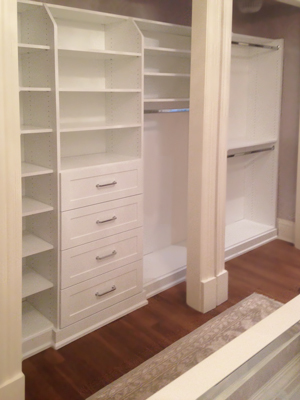 Having minimal closet space, this design takes bedroom organization to the next level with a beautiful wardrobe design. This design was created in an alcove in the wall to become a built-in wardrobe, essentially becoming an integral feature of the room. Shaker mission doors with frosted glass inserts are an upscale and stylish accent on this transitional design. This light, simple and fresh layout is easy on the eyes and gives a sense of relaxation when you enter the room. With its symmetrical hanging rods, shelves, and also a sizable section to place shoes, this design is perfect to display belongings prim and properly. 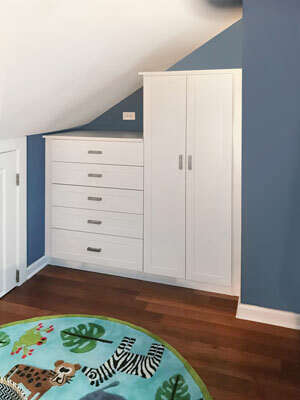 This beautiful built-in design was created for a child's bedroom and offers generous storage for clothing, games, toys, and more. The design fits perfectly under the slope of the room and maximizes this area with an organization system to last for years to come. This imaginative concept virtually creates a secretive area for hanging clothes and maximizes the space with corner hanging stretching into an alcove. 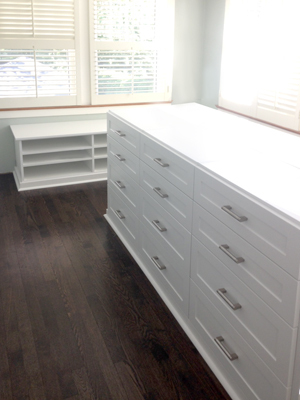 The generous amount of shelves and variety of drawers make organization a breeze in this unique layout. Finished in a sleek and smooth white, the area has a very airy and pleasant look. This design is a dream come true and makes organization luxurious. The walk-in closet includes hanging sections that span the wall and an island drawer system that gracefully occupies the center of the room. The island dresser provides a spacious countertop placing your accessories, decorations, or purses. In this view you can get an even bigger taste of what this design has to offer with the expansive and beautiful center island. 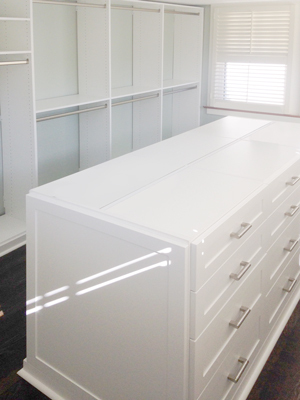 The array of drawers can all folded clothes, pajamas, undergarments, socks, and more. 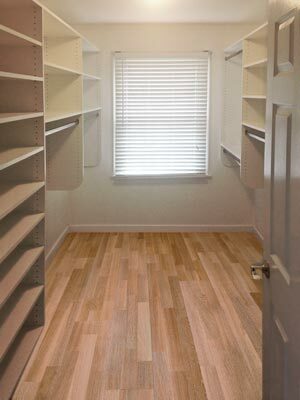 Also included in this walk-in closet is a convenient bench with cubbies for storing shoes. The convenient bench seat makes trying on footwear much easier. Playtime can leave an eyesore of clutter and a great organization system can make clean up a breeze and easier to maintain. 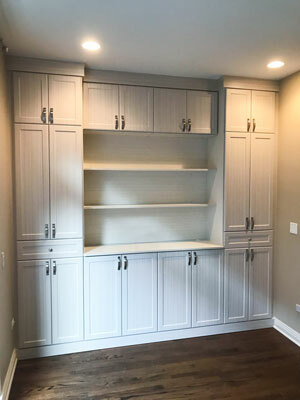 This basement closet helps keep the basement uncluttered by becoming the storage hub for sporting equiptment, games, movies, toys and more. Convenient wire baskets provide space for balls or stuffed animals. This design overcame the challenge of working around pillars and resulted in a beautiful and practical solution. The design offers a variety of hanging — long hang for long dresses and pants and shorter hang for tanks and t-shirts. 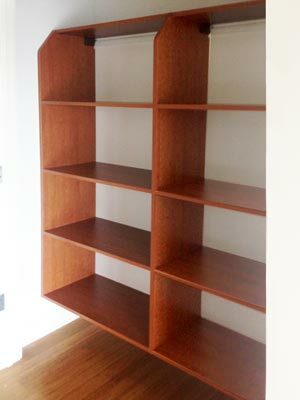 Shelves are provided for folded clothing and are a showcase for a soaring colllection of shoes. This wardrobe style closet is beautifully simple and amazingly practical — a winning combination for an easy goer in need of extra storage. The wardorbe design in Diva laminate offers considerable space for organizing all of your clothing. Four large drawers are provided for folded clothing and undergarments. Long cabinets include hanging for garments. Ginger Root laminate is presented as fresh lumber — ready to pair with any colors in sight. 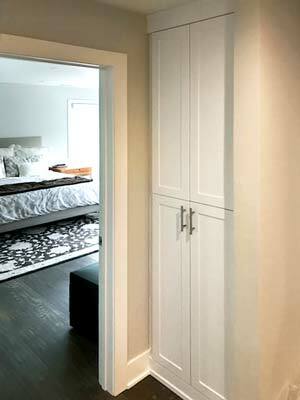 This all-inclusive wardrobe has been built into the recessed wall to become an integral part of the room. With a double closet hutch, elongated cabinets, and medley of drawers, this unit is an impressive solution to maximizing storage space in a light and refreshing wood grain laminate. This walk-in closet is dark, mysterious, and intriguing as it is functional. The Breakwater laminate with Oil Rubbed Bronzed hardware has a shadowy and dramatic look, perfect for a stylish gentleman. The top drawer locks for safekeeping of valuables. 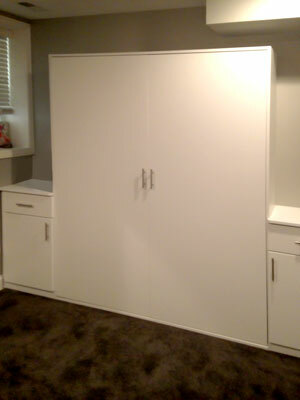 This beautiful white wardrobe is the perfect solution to increasing storage space in a bedroom. 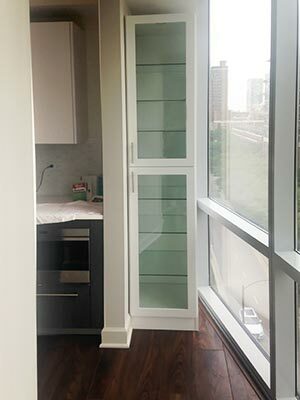 This unit has Regal drawer fronts and chrome Emerald handles. 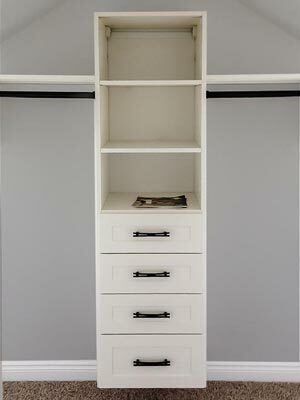 Elongated cabinet doors have been doweled together and open up to reveal double hanging rods. This linen closet is a great example how you can take a simple reach in closet and transform it into a beautiful and stylish statement piece. 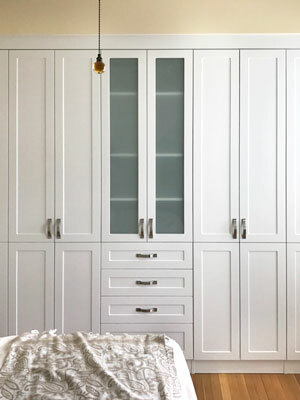 This small closet has quality workmanship with its Shaker Mission drawers and Bar handles — creating a transitional design that brings out the beauty in simplicity. As the focal point of the room, this media center is transitional and transformational. 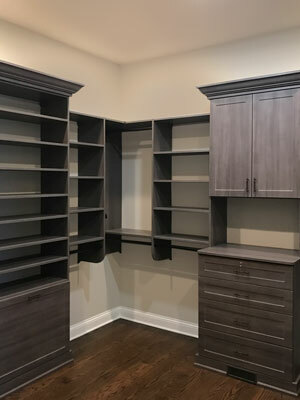 Spacious cabinets open up on 180 degree hinges to provide a comfortable work space with pull-out shelves for a home lacking proper office space. The white laminate, brushed chrome Emerald hardware, clear glass shelves and lighting accessories present an aesthetic that borders on traditional and modern matching the décor of the room. What was once a bare and empty wall has been transformed into a sophisticated masterpiece. 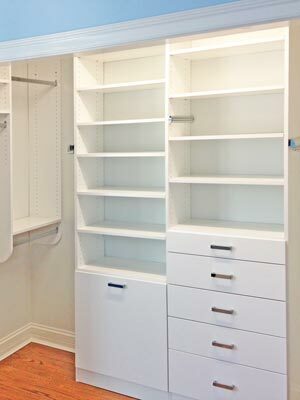 With plenty of cabinets and drawers for storage, this organization system eliminates the eyesore of clutter and maintains a lavish atmosphere to the room. Books and movies can be displayed on the shelves while the television which hangs effortlessly inbetween the system. The rich, dark tone against the white walls brings all attention on the prized place of relaxation in the home. Who wouldn't want to curl up with a good book or watch a favorite movie and feel the warmth of a fire on cold winter days? This design has a soft and pleasant ambience as it surrounds the fireplace. Colorful books catch the eye on the white and the double-sided shelves make them appear weightless. The cabinets below accommodate additional items and help keep the room well-kept, inviting, and organized. 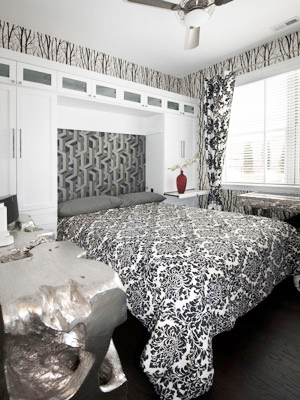 Customized to fit like a glove in this nook of the room, this design is artistic and functional. The convenient centered shelves are perfect for storing wine glasses, figurines, photos, or any other objects that can be showcased in the room. With its position behind the couch, the owner could walk over and open the cabinets to find extra snacks while they watch a movie or television. Also included is counter space which can act as a minibar and hold additional items. The River Rock laminate is soft and still bold becoming a statement piece for the room. Fitting for the modern and new-fashioned homeowner, this design is customized to stand out. The suspended shelving offers storage below for additional items. With die-cut corners at the top, the piece adds a dynamic and artistic flair to the room. 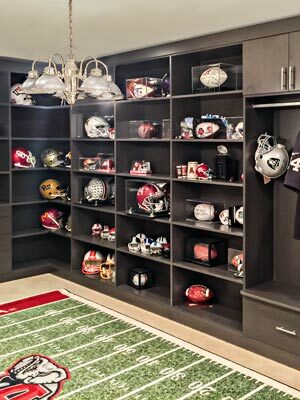 This design was created as a man cave masterpiece — including shelving and other storage solutions to display sports memorabila and other cherished athletic mementos. The design has a dark transitional look with brushed chrome Bar handles. 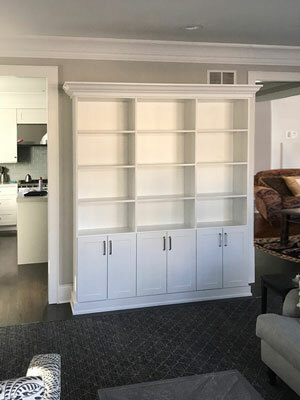 This wall unit is custom fitted into the nook of the room where it is completely out of the way in order to save space and organize assorted belongings. The design offers storage for books, decorations, or fine china and has plenty of drawer space for special cutlery and napkins. The rich color of the design against the light walls making it stand out in this part of the home. Not all family rooms need to be busy and cluttered in order to look lively. This light, peaceful, and uncomplicated design that surrounds the fireplace and television brings the room to life and creates a spacious and stress-free zone. Organization is made simple for all media essentials such as books, movies, photographs, or other cherished items. Below the shelves are cabinets to store items such as consoles with notoriously tangling wires that would otherwise look like a crowded mess. 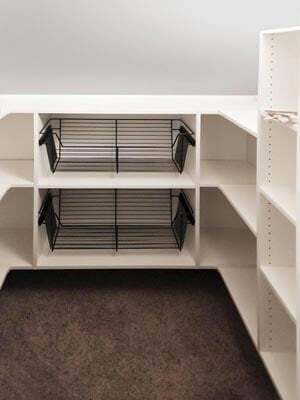 This simple design offers incredible storage with its expansive and equal shelving that stretches from floor-to-ceiling. With a design like this, you will wonder how you organized any other way before! 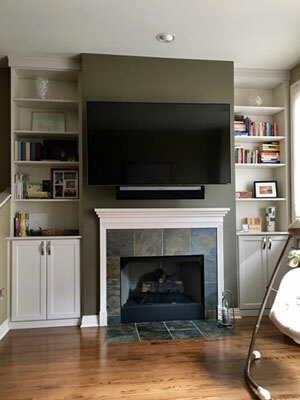 This beautiful family room media center provides plenty of storage for audio equipment, cable boxes and, of course, the TV. Closed cabinets hide the clutter from the media components, while open shelving above the television is perfect for display. 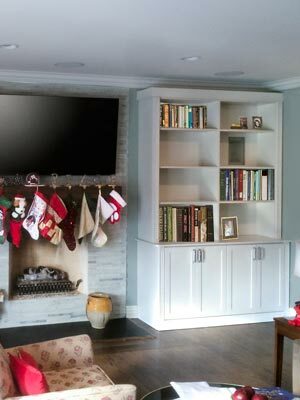 In addition, two sets of bookcases with lighted glass shelves on either side of the central media area provide space to showcase all those treasured family mementos, creating a very personal space for the homeowners. 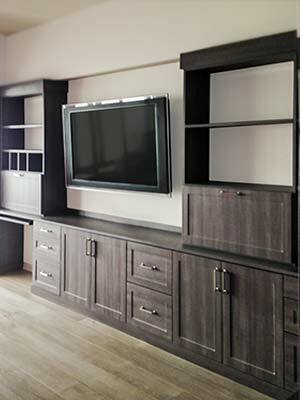 Two pull-out tables are located just above the drawers and to either side of the television. Hidden most of the time, these pull-outs can become a desk for doing homework in a pinch (when the TV is off, of course). They can even be pressed into service as side tables to serve drinks or hors d'oeuvers during parties. 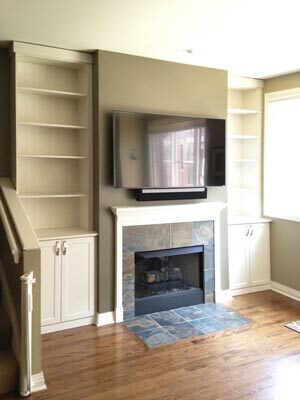 This design has a warmth, not from the fireplace alone, but from the joy this wall unit provides the room with. Cherished photographs, favorite books, and lovely decor are on display which give the room that "home sweet home" feel. The arrangement of shelves is balanced and lighthearted in its bright white laminate standing out from the forest green wall. 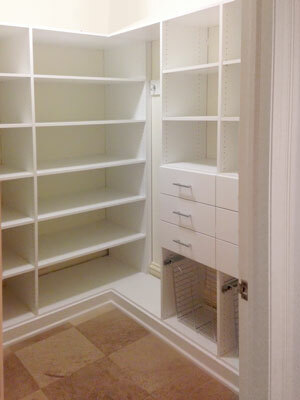 The cabinets on either side are perfect for concealing cluttering items such as video game consoles and board games. This design is in a custom White Chocolate laminate with brushed chrome Strap hardware creating a beautiful and transitional look to the design. This contemporary wall unit is ideal for extra home storage including bookshelves to display novels or a collection of movies. This living room wall unit is a breath of fresh air as it rests as the centerpiece from room to room. The white laminate is uplifting and the system is fully backed above the cabinet doors which conceal items that may clutter this expansive wall. 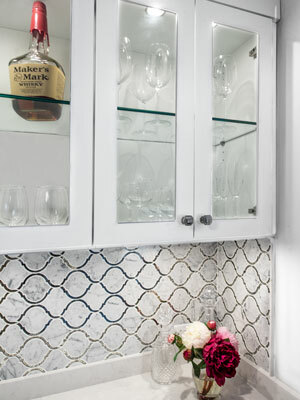 This client had an unused reach-in entry closet that offered the perfect opportunity for a home bar. The seamless homebar transformation includes Shaker Mission doors, custom lighting, glass shelves and cabinet inserts, and also brushed chrome Emerald hardware. This mini home bar design uses open frame Shaker Mission doors with clear glass inserts that allow a crystal clear view into the cabinets. Custom lighting shines through the glass shelving creating a breathtaking display of glasses and barware. Going grocery shopping can be exciting — picking out food you've had cravings for, getting all of the necessary ingredients for home-cooked meals, or finding great deals on some of your favorite snacks. The downside is when you have to lug all of the bags inside and put everything away. How horrible is it when there is limited room and everything is jam-packed into the same cabinet? Not to mention, you have to spend time looking through the mishmash when you need something. 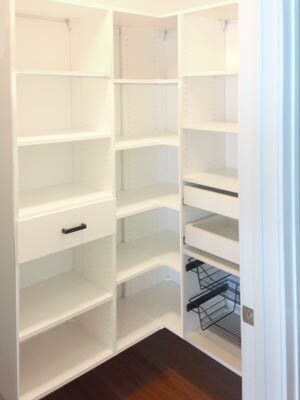 This pantry solves the problem of having to search through endless cans and boxes with tons of shelves for storage. 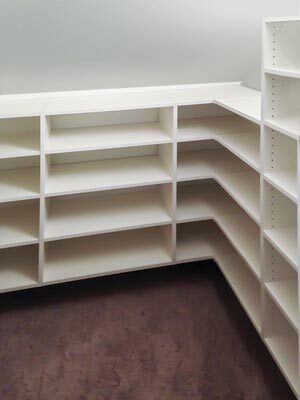 In the middle of this system, there is corner shelving that completely maximizes storage. Drawers and pull-out pantry shelves offer storage for stashing spices, napkins, paper plates, and utensils. This unit also provides pull-out wire baskets for easy access to perishable items. Not all apartments and high-rises provide a separate pantry and food is unfavorably stored in cabinets next to the same ones with dinnerware. 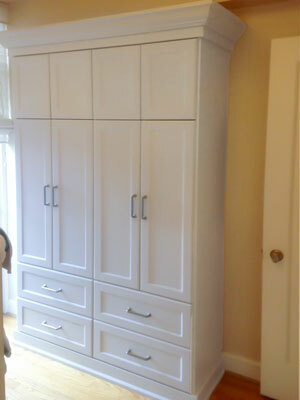 This unique design is convenient and custom-fitted for extra storage conveniently designed in the corner of the room. In this unit, canned and dry goods have sufficient shelf space and their own suitable place for keeping them organized in the home. With its glass windows and white frames, the unit is polished and perfect for a modern-style home. 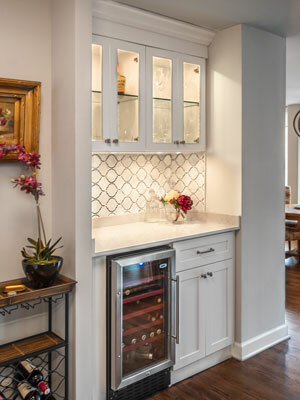 Lisa designed this basement bar in white with Harmony raised panel doors for upper and lower cabinets and a center wine cube. 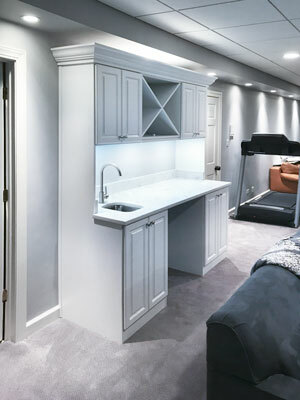 Three cool LED puck lights were also installed to illuminate the counter and truly make a showcase in this cozy basement. This Murphy type wall bed is impressively adaptable in which it maximizes living and work space in any element — whether it's a spare bedroom, a music studio, or an office. 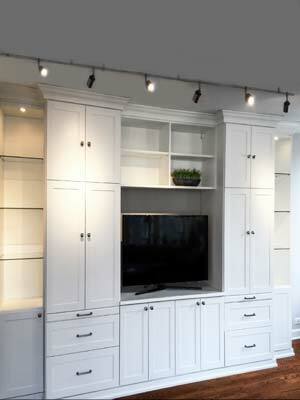 The wall bed cabinet has built-in LED lighting on a dimmer switch, making a lamp unnecessary to further take up space. 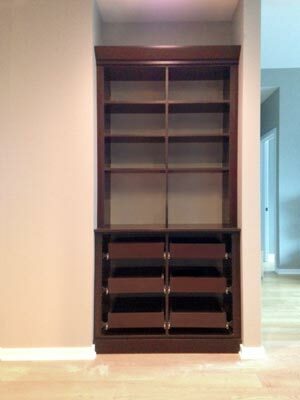 Shelving space is offered for an entire library of books, photographs, or other decor. The corner-wrapped desk ensures maximum desktop working space for this room. This wall bed built in the soft earthy tone of River Rock is simplistic yet refined. As an addition to a child's bedroom, the unit folds up leaving a generous amount of play area and significantly cuts down on clutter. 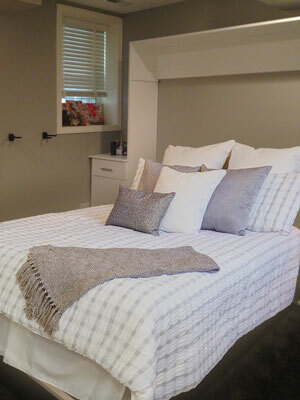 A cabinet and shelves are provided as the perfect space for bedside items when the mattress is in the down position. Adding a wall bed to a room gives you the freedom to transform a room into any kind of space. With extra floor space, the room can be used to exercise, as a play area for children, or an office. This unit folds up into elegant white laminate door fronts and unites as a wall unit with cabinets and drawers for extra storage. When in use, this wall bed is a perfect get-away for your guests to feel right at home in their own private space. The unit provides the perfect bedside table space for a glass of water or to set a book down before a good night's rest. 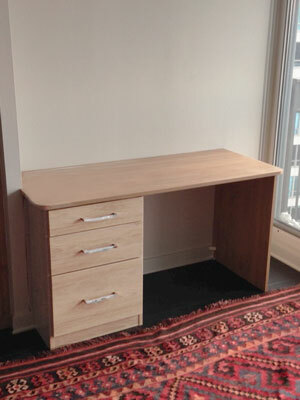 A matching piece to a stately bedroom wardrobe (See under Closet section) is this custom ginger root desk. Situated by the window, this workspace is welcoming for long days into the night and offers just the right amount of space for a laptop or stack of books. Outfitted with polished chrome square handles, although simplistic, this design has a subtle modern edge. This striking Murphy style wall bed design is ultra modern and has a high end look with luxurious features such as Unity wood drawer fronts and glass panel storage compartments. As this is a smaller room, this modern wall bed design saves a great deal of space and converts the space easily into a guest room. The modern and sleek design is a masterpiece both hidden away and folded down. 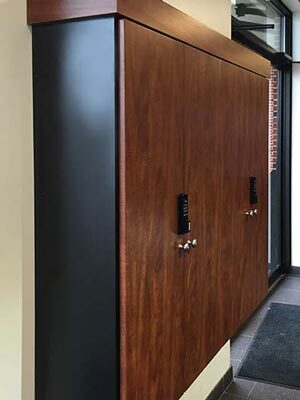 Offering a wide range of storage options with a unique, transitional look, this mudroom design matches function and style. Oil rubbed bronze wire baskets, a variety of hooks, and hardware offer an elegant contrast to the white Shaker Mission and Shaker Elite (bead board) panels. Additionally, an Aprés Ski bench countertop gives the versatile design extra flair. Organization is imperative for an auto dealership to keep track of the keys for the vehicles on the lot. In this design, the keys are easily accessable as they hang on a multitude of hooks for storing every key. The design was complete with security features to keep the keys locked up safe. The cabinets have sleek side panels on top of beautiful woodgrain laminate giving this design a contemporary and high-end look.